Phyllaphis are medium sized (elongate oval, pale yellowish green aphids, covered with wax wool. Wax is produced from well-developed dorsal wax glands. Their antennae are shorter than the body and have a very short terminal process. The siphunculi are pore-like. Winged forms have the abdomen wax-covered, with variably-developed dark dorsal cross-bars. The Phyllaphis genus contains 2 or 3 species on the leaves of beech (Fagus: Fagaceae). They have a sexual stage in the life cycle, but do not host alternate and are not attended by ants. Woolly beech aphids feed on the undersides of a young leaf of beech (Fagus spp.) causing the leaf to curl downwards on both sides of the mid-rib, forming a pseudo-gall (see first picture below). The wingless viviparae of Phyllaphis fagi are elongate oval, pale yellowish green, covered with wax wool. Their antennae are slightly shorter than the body and have a terminal process that is 0.11-0.12 times the length of the base of the last antennal segment. The body length of Phyllaphis fagi apterae is usually 2.0-3.2 mm, but summer dwarfs may be down to 1.1 mm. Winged viviparae (see second picture above) have the abdomen wax-covered, which largely conceals variably-developed dark dorsal cross-bars. 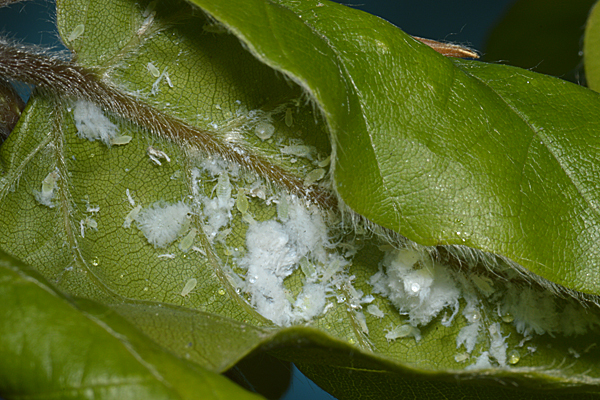 The woolly beech aphid feeds on the undersides of young leaves of beech (Fagus spp.). This causes the leaves to curl downwards on both sides of the mid-rib, and often to wither and die prematurely. It is distributed throughout Europe, east to Turkey and Caucasus. More recently it has been reported from China and Korea, and introduced to Australia, New Zealand and North America. Whilst we make every effort to ensure that identifications are correct, we cannot absolutely warranty their accuracy. We have mostly made identifications from high resolution photos of living specimens, along with host plant identity. In the great majority of cases, identifications have been confirmed by microscopic examination of preserved specimens. We have used the keys and species accounts of Blackman & Eastop (1994) and Blackman & Eastop (2006) supplemented with Blackman (1974), Stroyan (1977), Stroyan (1984), Blackman & Eastop (1984), Heie (1980-1995), Dixon & Thieme (2007) and Blackman (2010). We fully acknowledge these authors as the source for the (summarized) taxonomic information we have presented. Any errors in identification or information are ours alone, and we would be very grateful for any corrections. 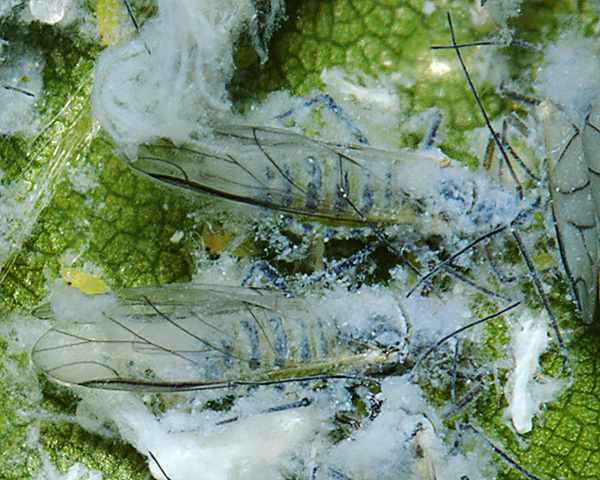 For assistance on the terms used for aphid morphology we suggest the figure provided by Blackman & Eastop (2006).